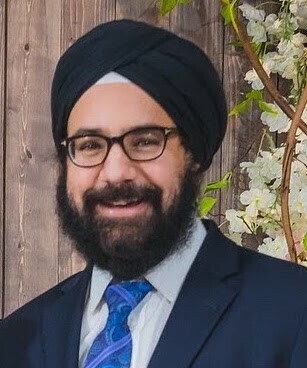 Mandeep Singh Chandna passed away on Thursday, January 31, 2019, at the age of 43. Mandeep is survived by his wife Manmeet Kaur Chandna, daughter Aikam Kaur Chandna, father Mehar Singh Chandna, sister Ameet Kaur Kooner (husband Gurjeet Singh Kooner) and niece Sanaa Kaur Kooner. There is comfort in knowing he is with his mother, Jasbir Kaur Chandna. Born on December 31, 1975, in Calgary, Mandeep, affectionately known to everyone as Montoo, had an infectious laugh and affable personality. His kind and gentle spirit put others at ease in any situation. He completed his education at Westgate Elementary, Vincent Massey Junior High, and Western Canada High School. He then attended the University of Calgary where he received his Bachelor of Commerce in Economics. Upon graduation, Mandeep joined his parents at the family business, Bombay Jewellers, which later became Koh-i-noor Jewellers. Keenly learning every detail, after several years he assumed full responsibility of the business his parents started over 40 years ago. Together, they created a trusted mainstay in the jewelry industry. Through Koh-i-noor Jewellers, Mandeep played a role in the celebrations and milestones of countless people. His inviting smile, caring nature and humble approach, left every customer feeling truly special. Never one to rest on his laurels, Mandeep also successfully managed commercial real estate and development. Most recently, his endeavour to establish a dental clinic with his wife Manmeet meant a great deal to him. While achieving professional success, Mandeep’s central focus was to love and care for his family; he would do anything for them. His wife Manmeet and daughter Aikam were the light of his life. He cared deeply for them and loved every moment he had with the two of them. His great adoration for his parents and sister provided him with constant happiness. Mandeep lived his life following the values of his Sikh faith, he was a devoted son, brother, husband, father, cousin and friend. His smile and laughter will resonate forever in the hearts and minds of those that were so privileged to know Mandeep. He will be deeply missed. Funeral services will be held at 1 p.m., Thursday, February 7, 2019, at Country Hills Crematorium, 11995, 16 Street N.E. Prayer services will follow at Guru Ram Das Darbar, 5225 84 Street N.E. Heartfelt sympathy & condolences to the Chandna family. May god rest his soul in eternal peace. Our condolence to the family. May god give peace to his soul. Manmeet you will be in our prayers dear. So sorry for your loss. I still can’t beileve this happened. Stay strong dear. Jo upjayo so binas hai. Paro aaj ke kaal. May Waheguru give the family strength, courage and Gurumat to go through this tough time. Our condolence to the family. So sad. We are so very sad to hear of the passing of Mandeep. He was such a nice man, always pleasant to deal with. A truly beautiful person inside and out. We cherished our relationship with Mandeep and always tried to do the best for each other. We will miss him dearly. Our sincere condolences for all the family at this very difficult time. Sincere Condolences Ameet. My heart goes out to you and your family at this difficult time. Thinking of you and sending love. Deeply sorry to hear this news. He was such a kind and humble soul. Always so welcoming and friendly. Thinking of the family. Deepest condolences, our thoughts and prayers are with the family. My heartfelt condolences to the Chandna family. You are in my thoughts and prayers at this difficult time. My deepest condolences, thoughts and prayers with the Chandna family. Deepest condolences to the family and prayers for the departed soul. Deepest condolences to the family. May his soul rest in eternal Peace.